Explore the Costa Rican Cloud Forest while Riding Treetops and Horses. Thrill-seekers from all ages and levels of experience, willing to explore the Arenal volcano area. Arenal has a lot to offer, and this exciting combo lets you spend a day full of excitement and nature in La Fortuna. Simply take a short trip to the property where the action takes place, and let the adventure begin. Ride and swing among trees, spot all kinds of birds and mammals, and then finish with a trot across the mountain on horseback. The best way to experience Arenal, the adventure capital of the country, is with a rush of adrenaline. This combo provides plenty of opportunity for thrills and excitement. Glide and gallop across the area and enjoy great views of the cloud forest, the volcano, and its cooled-off lava. 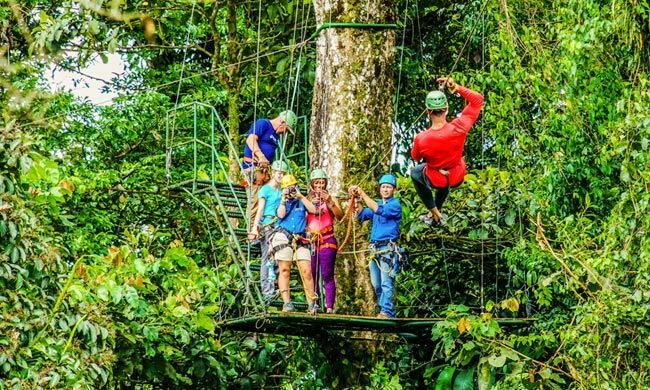 This Arenal canopy tour begins with an expert guide providing safety tips so you can make the most of all 8 zip line cables. It’s an activity designed for adventurers of all ages and levels of experience, so there’s no need to be shy. Climb a 42-feet-high tower, and slide across all 14 platforms. Five of those platforms are also built on trees from the forest, providing a first class view of the lush canopy and all its inhabitants. Keep your eyes open for a chance to see spider monkeys, snakes, sloths, bats, and countless birds, including toucans, falcons, and motmots. Speeds can reach up to 37 miles/hour, and some of the zip lines extend to 2460 ft in length. Don’t forget to give your guide a phone or camera, as there’s also plenty of opportunity to pose for photos. Stop mid air and let the guide take pics of you defying gravity among the trees. The highlight of this trip comes almost at the end. The Tarzan swing is exactly the adventure it sounds like. Hold onto a rope on a big platform, and swing into a canyon. The trees split here and leave the magnificent Arenal volcano on sight. Replenish your energy with a snack at the end. Munch on seasonal fruits like pineapple and watermelon before heading out to the next part of the adventure. After seeing the forest from a bird’s view, it’s time to get a bit more grounded. Arrive at your destiny after an hour of riding. El Silencio observation point honors its name, which means Silence in Spanish. It’s a flat area in the forest with incredible panoramic views of the Arenal volcano. Listen to woodpeckers and robins interrupt the reigning silence, breathe in the fresh air and enjoy the green scenery around the massive volcano. Admire the dried lava trails that follow the volcano’s outline all the way to the ground in a display of dormant power. This tour is a good opportunity whether you are an expert rider or a beginner. The horses are very skilled, even in steep inclines. Sometimes it even feels like they’re doing all the hard work by themselves, so leave your worries behind. A guide accompanies you during this journey. In case you only have time or energy for one of these activities, contact us and we can arrange that as well.